From surfing the Pacific to hugging lions in South Africa, GoPro has built its brand around being a lens into parts of the world many of us will never see. But for this newest ad, the camera's crew got to experience their subject in a way even more personal than before. "Brasil – For The Love" is a refreshing break from the seemingly endless parade of big-budget, star-studded, competitively fueled World Cup ads we've seen in recent weeks. While this year's World Cup spot have frequently been stellar, especially Nike and Beats, there's a certain repetitiveness to the adrenaline-pumping staccato that's already left me exhausted before the tournament even begins. 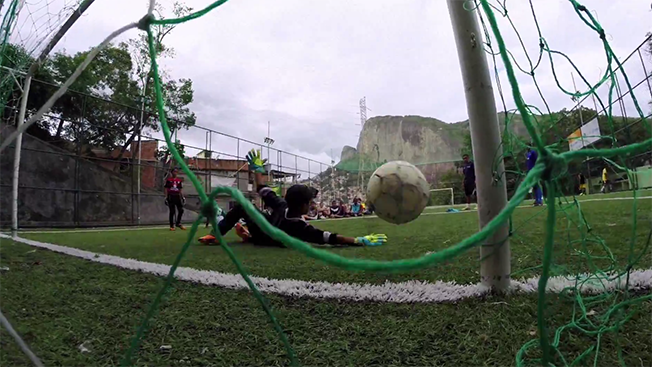 True to its marketing persona as a sort of virtual-reality tour of the world, GoPro has created a World Cup spot all its own by focusing on the real faces of Brazil's soccer-centric culture and bypassing the pros. Well, sort of. There is one pro, and he's central to the story, though you'd never know it from watching the ad. Davis Paul played professionally, albeit briefly, for the Chicago Fire before joining GoPro as its media manager. When he arrived in Brazil to film and produce the spot, his talent, knowledge of the game and curiosity about Brazilian futebol culture made him a unique ambassador, and the result is a pretty phenomenal collection of clips shot largely in the sprawling and dense neighborhoods of Rio de Janeiro's largest favela, Rocinha. It was amazing to see such an overarching passion for the sport. When entering Rocinha, I expected chaos. I expected a lot of selfishness—survival of the fittest, if you will. What I quickly found was a community full of caring people who were all looking out for one another. They were all fighting the same fight, so there was no use in fighting each other. We started as a couple of Americans wandering aimlessly through the favelas. By the end, we couldn't walk more than a few minutes before some kids would grab us to go play pickup. Although we have all these resources in the States—fields, equipment, coaches, leagues—we are still behind in terms of development. These kids don't think when they play; they just feel. They take chances, they aren't afraid, and they were confident! As soon as they learned I played professionally, all it did was put a target on my back. Every kid wanted the ball so they could take me on. So much confidence … I loved it! The game is just raw there, and it's always being played. There are no big fields, no coaches teaching formations, no rules. The game is pure. It wasn't about who scored the most, but who played the best. I only wish I could have bottled that mentality and brought it home with me. GoPro says it will continue to post "a series of episodes and moments" throughout the World Cup, so if you want more like this, keep an eye on the brand's YouTube channel.